The great sage Benjamin Franklin observed, "In this world, nothing is said to be certain, except death and taxes." While science may have extended the average human life span—a recent segment on public radio discussed ongoing studies that could help us live to 250!—and we may rage against "the dying of the light," the Grim Reaper claims us every time. 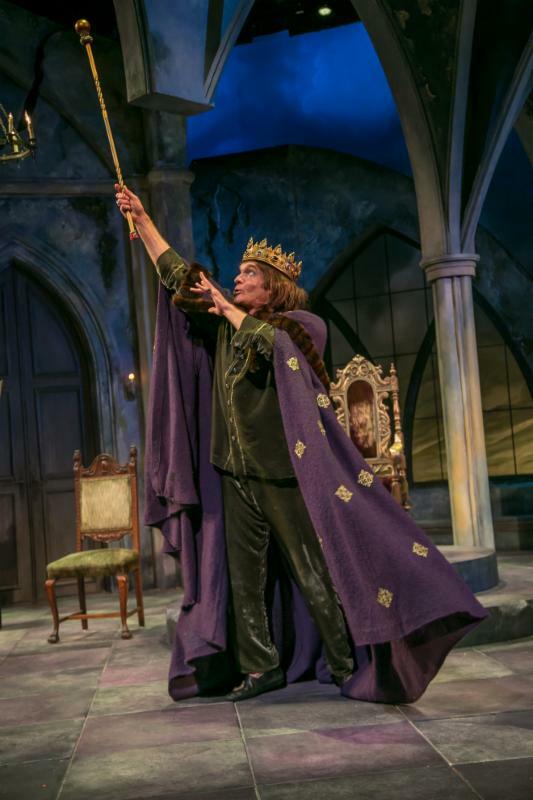 Combining absurdity and stern seriousness, Ionesco chronicles the final hours of King Berenger the First's centuries-old reign—and life—come to a close. His country is shrinking, his people are sterile, his castle is literally cracking apart and the natural forces he used to control no longer obey him. He "does not go gentle into that good night" but defiantly fights its inexorable approach, trying to ignore his increasing evident physical and mental deterioration. Meanwhile, a battle royal between his two wives ensues, with young Queen Marie entreating him to survive while the older, wiser ex-Queen Marguerite urges him to accept death—until at last all those around him disappear and the lights go out. Bonnie J. Monte's superb direction, along with the excellent cast she's selected, makes the play's 90 minutes fly by—no mean feat for a script that involves more talk than action. As the king, Brent Harris (Right) literally ages before our eyes, going from a spry egomaniac to a decrepit shell right before our eyes. The transformation involves not only a white wig but Harris's masterful projection of physical decay; it's magical to watch. And Harris’s recollection of a cat he once owned is poignant in its regret. Marion Adler is equally remarkable as Marguerite (below right), the woman who has known Berenger the longest, the older woman who has no illusions about life. She gives it to him straight, sparing no details of what awaits him. She nags everyone as she attempts to give him a good death. Adler's proficiency with long blocks of text is admirable. Jesmille Darbouze's Marie (below, left) also nags Berenger (Brent Harris, center), but this time in an attempt to will him to live. With her earnest entreaties seem hollow in the face of his increasing (and encroaching) disability, Darbouze conveys the callow invulnerability of youth marvelously well. Annoyingly and futilely giving his two cents worth is Greg Watanabe (top image, far right) as The Doctor. He's appropriately pompous, yet clueless, as to how to deal with a dying patient, and his obtuseness breathtaking. John Barker does a neat comedic turn as the Guard, a jack-of-all-trades now that there isn't much left of the royal family left to protect. He's reduced to repeating inane phrases, wrestling with a recalcitrant visor on his helmet and introducing some absurdity into the plot. But once again (as in other Ionesco plays), a saucy maid steals the show. Portrayed by the ever-brilliant Kristie Dale Sanders (image, far left), Juliette is wiser than all the royals and learned men. She really nails the difference between the royal 1% and the rest of the folks in a hilarious recitation of what passes for an ordinary day. We are exhausted just listening to her to on about her endless duties at the castle and at home! Sanders' sly delivery makes Juliette the most subversive of the characters, for she alone knows what it's really like to live. She's a far cry from the self-absorbed king who thought he could live forever so that he never even bothered to notice what was going on around him. But now, Death the Great Leveler has brought him down to her level—which she finds quite delicious. Once again the STNJ's production values shine. The decline of Berenger's country is immediately telegraphed to the audience by Brittany Vas whose design features a drafty, dilapidated throne room marked by huge cracks in the wall that get bigger as time passes, an exploding radiator, recorded trumpet flourishes and a threadbare throne. 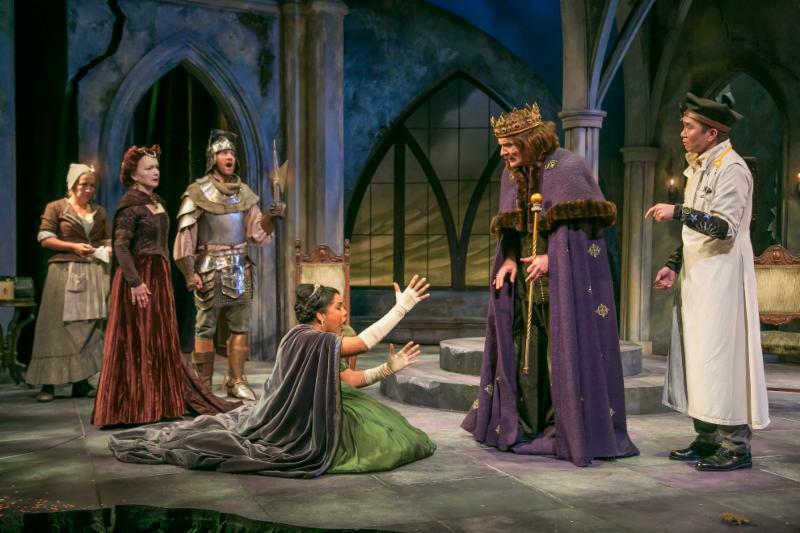 Karin Graybush's sound design includes ominous earthquake rumblings as Tony Galaska's lighting dims incrementally as the King grows older and weaker. 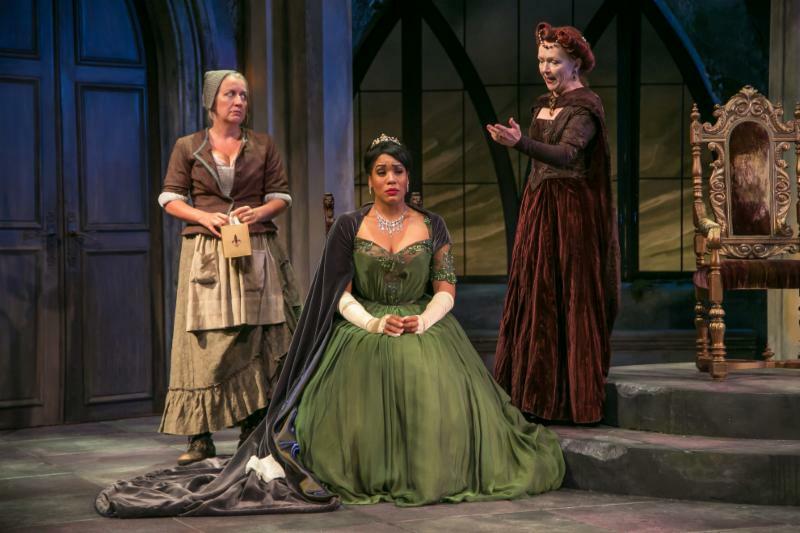 And Hugh Hanson's costumes, with their ratty velvet cloaks and gowns, fit the situation to a T. Emilia Martin is to be complimented on her wigs. Exit the King is, at its base, a parable that teaches us to value life and its experiences while we live it, not when we approach death. Berenger thought he could choose whether to live or die, that "die" and "exist" were just figments of our imagination. He plaintively bleats, "Why was I born if not to live forever?" Eugene Ionesco's play, the most linear of his works, is an admonishment that rings especially true in this age of technology, when virtual reality threatens to take the place of real experiences, when video games provide an escape, when establishing friendships on Facebook are substitutes for face-to-face encounters. It is a warning to us all—young and old—that we should not put off life until death looks us in the eye. A valuable lesson, indeed. Exit the King will be performed at the F.M. 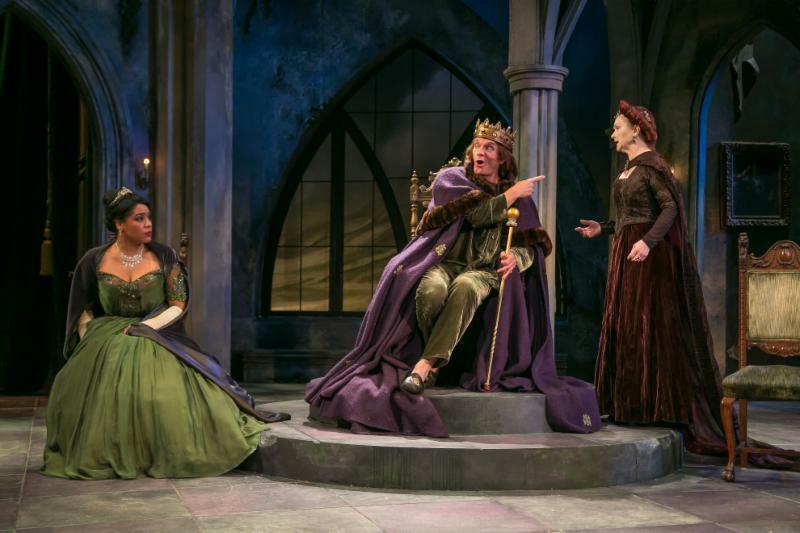 Kirby Shakespeare Theatre, 36 Madison Ave., Madison, through August 28. Talk backs with Bonnie Monte and the cast will take place after almost every performance. They are not to be missed! For performance information and tickets, call the box office at 973.408.5600 or visit www.ShakespeareNJ.org online.